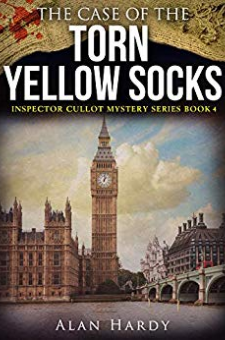 Another nail-biting murder investigation for Inspector Cullot, and his world-famous Murder Squad. As well as Inspector Cullot himself, as suave, debonair and ruthless as ever, we meet again the beautiful, sophisticated Stephanie Gorge, Cullot’s own daughter; Cullot’s faithful sidekick, Sergeant Watkins; and the perpetually baffled PC Blunt… They are engaged in a race against time to find the murderers of three wealthy men, gruesomely dispatched in three of the poshest apartments in London. Amongst the array of suspects are a collection of gorgeous women, and men, from across Europe. Does the key to unlocking this case turn on the nationality of the victims, and suspects? And what’s the relevance of the colour of the victims’ socks? And what is the role in this affair of Janice Butler, ex-Hollywood movie star, and the love of Inspector Cullot’s life? Is stunningly beautiful Stephanie, Cullot’s daughter, romantically involved with one of the prime suspects? Greater urgency is given to the squad’s investigations when Stephanie is kidnapped. Unless she is rescued, she runs the risk of being added to the list of gory victims. Is Cullot up against the most relentlessly vicious of his opponents, and possibly the most infamous gang ever known in the annals of the history of crime? How will he react to his daughter being in mortal danger? How will Sergeant Watkins manage to carry out his duties, tormented as he is by his burning love and desire for Stephanie? How will PC Blunt ever find out what is going on? A mass of bewildering clues, and probably the world’s greatest ever analytical mind, come together in the unfolding of one of the Inspector’s most baffling cases, rising to a crescendo of drama, suspense, intrigue and nail-biting tension in one of London’s swankiest and most luxurious districts. Can you home in on the vital clues, disregard the red herrings…and spot the killer…or killers?